Use to turn a large, awkward power connector into a smaller, streamlined connector. Allows you to attach bulky wall wart power supplies to a power strip or a wall outlet without blocking other outlets. Save and maximize space on power strips, surge protectors, and wall outlets. 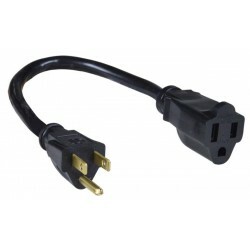 Use as a convenient 1ft power extension cord for hard to reach spaces.